Values of pots are important. The 500K volume pot can be used to clean up the sound and makes the tone nicely softer and a little bit warmer. The 250K tone pot will give you a good, distinct control over the low pass filter. Capacitors controlled by toggle switches are also interesting thing here. There is 8,2nF (0,0082uF, 8n2)) and 0,015uF cap. When both will be in the circuit, they will work as one 0,0232uF. When one of toggle switches is off, the capacitor, which is connected to it, will be completely out of the circuit, so it will not affect the tone. Small cap, 8n2, is good for making the tone a little less trebly. When both caps are working together, it is more like a typical electric guitar tone control. When only 0,015uF is in the circuit, it's something between previous options. The cap can be a ceramic type. The 0,015uF should be a film capacitor. 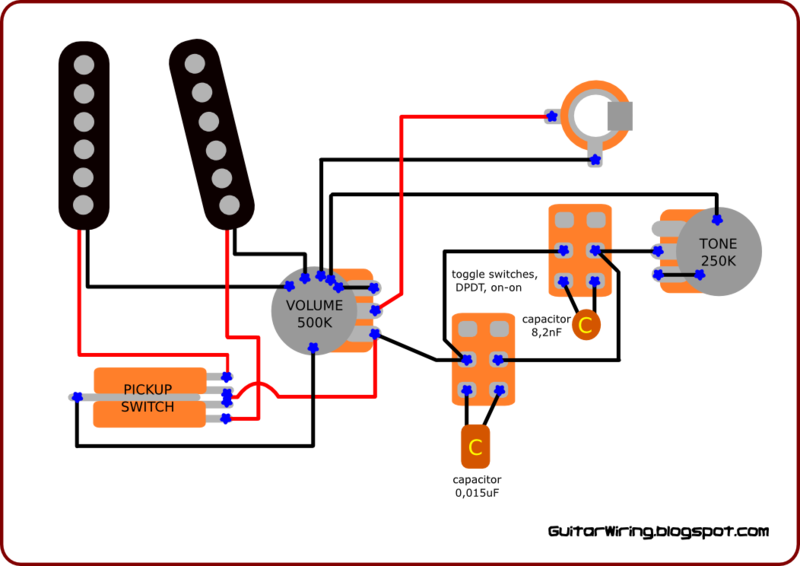 If you want (or don't have a place for toggle switches), you can use push-pull potentiometers, so toggle swiches will not be needed.